Australian flag, Sydney Harbor, Sydney, Australia. 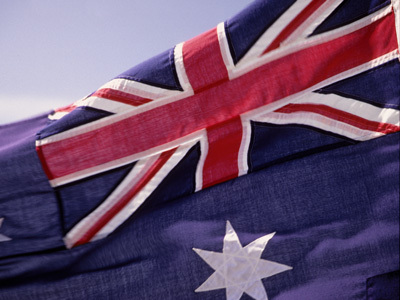 First designed in 1901, the flag of Australia features a white seven-pointed star known as the Commonwealth Star, which represents the six original states and the territory of Papua. Canon A2E, Fujichrome, 1996. Sydney Skyline, Sydney central business district, Sydney, Australia. Canon A2E, Fujichrome, 1996. Sydney Opera House, Sydney, Australia. The roofs of the Sydney Opera House are covered with 1,056,006 glossy-white and matte-cream tiles made by AB Hoganas in Sweden. Canon A2E, Fujichrome, 1996. Sydney Opera House, Sydney, Australia. A UNESCO World Heritage Site, the Sydney Opera House features six separate theaters under its arc-shaped roofs. It is one of the busiest performing arts centers in the world. Canon A2E, Fujichrome, 1996. Sydney Opera House, Sydney, Australia. Formerly completed in 1973, the Sydney Opera House cost $102 million. It was designed by Danish architect Jorn Utzon. Canon A2E, Fujichrome, 1996. Sydney Harbor Bridge, Sydney, Australia. In 1923, 799 homes and a high school campus were demolished in preparation for the construction of the bridge. Canon A2E, Fujichrome, 1996. Sydney Harbor Bridge, Sydney, Australia. 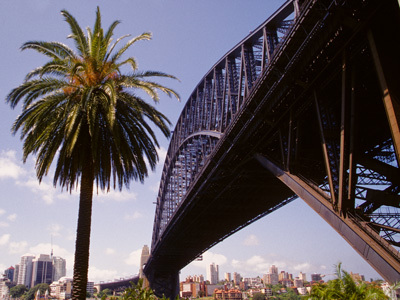 The eight-lane Sydney Harbor Bridge weighs 39,006 tons. Most of the steel used in the construction of the bridge came from Middlesbrough, England. Canon A2E, Fujichrome, 1996. Sky Princess, Sydney Harbor, Sydney, Australia. Built in France in 1984, the 46,087 ton Sky Princess is one of the last steam turbine cruise ships in the world. The ship was renamed the Atlantic Star in 2009. Canon A2E, Fujichrome, 1996. Grave Mask, North Island, New Zealand. Canon A2E, Fujichrome, 1996. Lake Rotomo, New Zealand. Approximately 272 feet deep and formed 9,500 years ago after lava flows blocked its outlet, Lake Rotomo is located exactly halfway between the city of Rotorura and the town of Whakatane. Canon A2E, Fujichrome, 1996. Civic Theater, Auckland, New Zealand. Built in 1929, the Civic Theater is largest surviving atmospheric cinema in Australia. The Civic was recently used in Peter Jackson's remake of the movie "King Kong." Canon A2E, Fujichrome, 1996. Cafe, North Island, New Zealand. Canon A2E, Fujichrome, 1996. Thermal deposit, Rotorura, New Zealand. Nicknamed "Sulphur City," Rotura is an important geothermal area and part of the Waimangu Volcanic Valley which was created by the Tarawera Eruption on June 10, 1886. Canon A2E, Fujichrome, 1996.